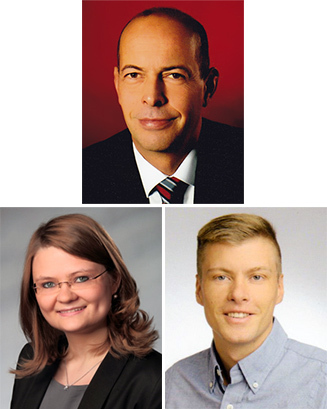 03/04/2014 Lesjöfors Springs GmbH have recently appointed Mr Toralf Heise to the position of Business Development Manager for North Germany, while Irene Fritzler and Dennis Schalinsky have joined the customer services department based in Hagen, Germany. Toralf Heise joins the company from hi-fi specialist AIV GmbH, based in Heilbronn, where he spent 13 years as regional sales manager. Mr Heise has over 20 year's sales experience in the audio/visual market, before which he worked as a metal cutting mechanic for the Hydraulik Nord Group in Parchim, Germany. Toralf Heise is 48 years old and lives in Matzlow, North Germany. On January 2nd 2014, Irene Fritzler and Dennis Schalinsky, both 27 years old, joined the Lesjöfors team as part of the customer services department based in Hagen, Germany. Irene Fritzler was born in Kazakhstan and moved to Germany when she was 10 years old. Irene speaks four languages - German, Russian, English and French - and has extensive training as an industrial clerk, along with export and customs experience. Dennis Schalinsky, born in Recklinghausen, has trained as both a mechatronics technician and a wholesale salesman. Dennis has excellent mechanical know-how and speaks German and English. Irene and Dennis will enhance the customer services department in Germany, working alongside the existing team to exceed the high expectations of all customers. 'We are very happy to have found the right people with specialist knowledge in their specific fields. Toralf will increase Lesjöfors' visibility in the market by regularly visiting our customers and offering excellent support. 'Irene's language skills will allow her to support a wide range of Lesjöfors customers in a professional manner, while Dennis' technical expertise will be a great asset to the company.